Given below is the list of Top Arts Colleges in Andhra Pradesh 2019 with ranking for BA and MA Courses. The School of Planning & Architecture - Jawaharlal Nehru Architecture and Fine Arts University (JNA&FAU) was established in the year 1940. 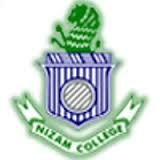 Nizam College, Hyderabad is one of the oldest institutes in India that was established in the year 1887 during the reign of Nawab Mir Mahboob Ali Khan.